Teachers can now manage their bookmarks more effectively by clicking on the Manage button. Teachers can drag and drop in any order, add more folders, name them, and delete multiple bookmarks simultaneously. Teachers will now see the scope, element, and activity titles in the Assignment Listing and in the Planner dropdown. This will help identify the specific nature of the activity without having to dive into the activity itself. "Did I already assign this?" Now teachers can see when they last assigned something, so there is no confusion. 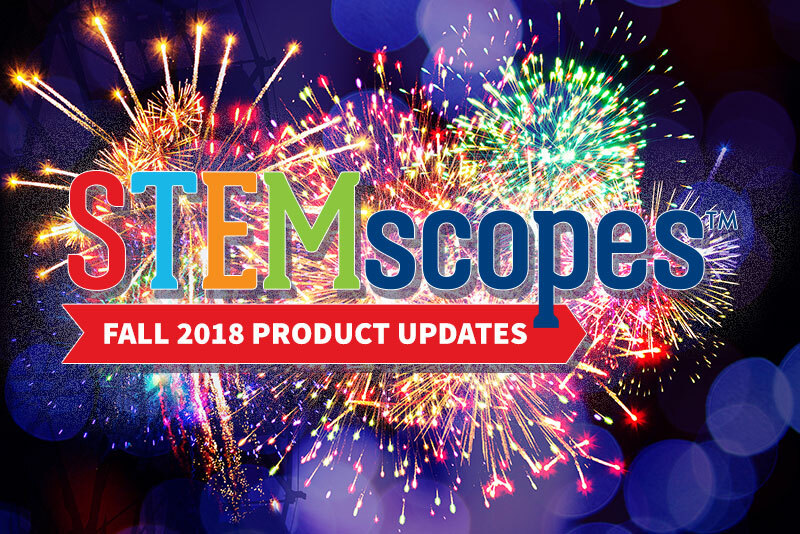 Teachers will now be able to receive updates about STEMscopes. We added this feature to better communicate when content changes are made or when new features are launched on the STEMscopes platform. Look for the megaphone icon on the Home screen. In the past, teachers used the main drop-down menu to go from a teacher element to the student version of that same element. Now they can easily switch between the teacher and student views of an element using the T/S button on applicable element screens. Moving between pages is more efficient than ever, and teachers can even hide the anticipated student responses during whole-group instruction. Teachers can now print most pages in STEMscopes at the click of a button. The documents will generate content exactly as it appears on-site. More enhancements for this feature are in the works. Don't want students to see answers during the lesson? Hide them! The open eye on the top toolbar means the answers can be seen. A line through the eye means that answers will be hidden on the page you are viewing. Teachers and students can now add comments to a page without highlighting first. Just select the text and click the Comment button. We have rearranged the filters on our assessments to make it easier for teachers to find questions tagged to specific standards or lessons. Now, more than one teacher can grade/view student work. If co- teachers or multiple teachers share these duties, they can all help grade student work. Consolidated Grade View We've been working to speed up the grading process for teachers. Teachers will be able to see quick snapshots of student work completion and quickly grade and enter feedback for a question for a whole section. Coming soon! If teachers have notes and highlights on a page and try to print it, a pop-up will appear asking if they would like these to be printed. In the past, students would have to save their work in our TUVA elements via a snapshot and print it. We've been working with TUVA on a save state function that will allow students to save their work by clicking a button; it will get sent to their teacher with the rest of the assignment content. Coming in September! Teachers now have the option to limit access to scopes from other grade levels within the student's Learning Resources portal. Students will now see only the scopes for their grade level unless their teacher has allowed them to see more. In addition to the platform updates, there are content-related updates, below, highlighting some of the additional curriculum and instructional resources that are available in the curriculum. Teachers currently using our products for Tennessee, Ohio, North Carolina, Georgia, Mississippi, and Alabama now have tiered reading passages, organized by Lexile level, available in the Teacher Toolbox. Visit the Literacy section of the Teacher Toolbox for additional information! The Books on Topic element featured in some of our product editions now has a master list that has been published in every edition's Teacher Toolbox. Look for the Books on Topic master list in either the Resources or Literacy section of the Teacher Toolbox. Over the last year, we have added editable Google Doc files for our Explores, but we are now making them available for our generic Linking Literacy documents as well. Look in the Teacher Toolbox to check out this resource for a wide variety of graphic organizers and activities to support student comprehension of scientific text. In our Texas product, we have added three new elements: Communicate Science and Linking Literacy (in the Explain section) and Science Today (in the Elaborate section). These resources are intended to promote dialogue, comprehension, and the application of STEMscopes science concepts. NGSS 3D: New and Improved! Our team has been hard at work overhauling our NGSS curriculum, which officially launches this year as NGSS 3D. There is an incredible variety of new elements, including Investigative Phenomena, Scientist Spotlight, and new Explore types that include Inquiry Investigations and real-life data sets. Our Hook and Explore activities also feature an improved setup video format. Our NGSS 3D product is available in Spanish for Kindergarten through middle school, and our team is currently finishing up the translation of our NGSS Teacher Backgrounds for elementary and high school scopes. These will launch on the site in October. For additional feature information, access the STEMscopes Help page by clicking the Help button on the blue toolbar at the top of the page. Our team has reviewed and updated many of the PDF resource documents available to help you get the most out of your STEMscopes experience!